In the picture below, you see the first hard disk drive. 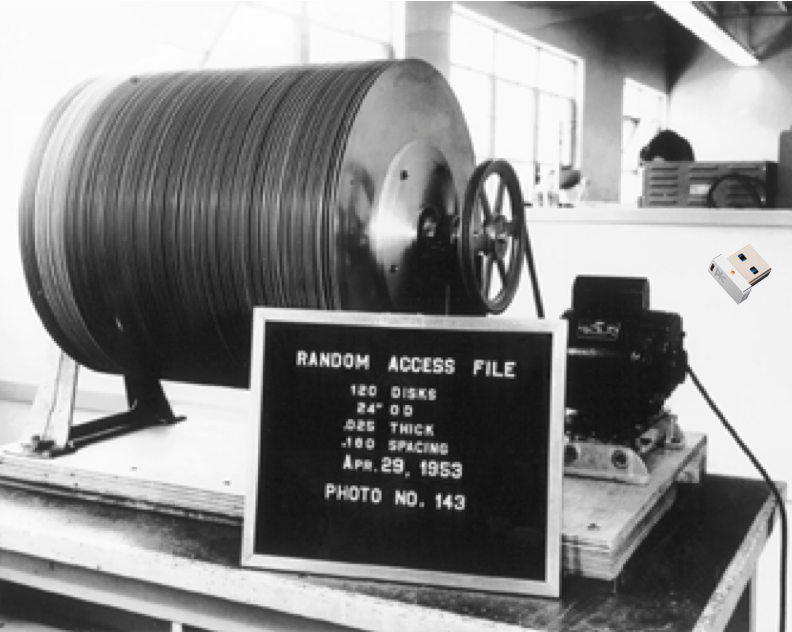 Developed by IBM in 1952, it carried a whopping 5 MB of data on fifty twenty-four inch disks. It was leased to customers at about 3,200 USD (equivalent to 27,500 USD in 2013) a month. It weighted over a ton and was typically delivered via cargo plane. Here is some more information about it. On the same picture, and massively scaled up so you can even see it, is a 64 GB, USB3 thumb drive developed by pkparis.com in 2013. It is sold at about 80 USD, weighs about two grams and is delivered via normal postal mail, attached to a small card board. In other words, within 60 years, not only has the price per GB come down from a (very theoretical: neither was the space feasible, nor did you really own the device, so we’ve to depreciate over 12 months) 5.5M USD to about 10 cents and the weight per GB down from about 200 t to 0.3 g.
More interestingly (and even more theoretically), in today’s currency, the newer drive, in terms of disk space, would be about 50 million times less expensive and 640 million times less bulky. But, don’t rush at conclusions about “old technology!” From a speed perspective, interestingly, today’s drive is “only” 250’000 times faster writing and 1.4 million times faster reading: To read or write 1 GB of data in 1952 you would have spent 2.3 hours (assuming the space would have been available; also assuming that read speed was equal to write speed) vs. about 30 seconds today for writing and 6 seconds for reading. We have of course much faster storage options available today, but comparing these two products, if you wouldn’t bother if your memory stick had just 1 GB, weighed about 200 tons and set you back about 5.5M USD, assuming that memory sticks are used mostly for reading data, IBM’s product would be an excellent choice: from a price vs. speed perspective, speed would actually outperform price 40 times, and likewise, speed would outperform weight 460 times. In other words, the IBM drive was 37 times faster than we would have expected from a price point of view, and 450 times faster than expected from a weight point of view. See here to calculate yourself.